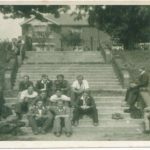 On 23rd July 1920 a letter from Shirley Workmen’s FC was received, requesting permission to continue playing on Shirley Rec [as St.James’ Park was then known]; also a letter from the Old Comrades Association for the Church Lads Brigade, applying to play on Saturday afternoons. There was also an application from appeared to be The Maypole FC for use of the ground on a Wednesday afternoon. The Old Comrades Association, for the Church Lads Brigade, applied again in 1921. In 1924 when Shirley Workmen’s FC applied for permission again, the council response changed to “the committee cannot guarantee any club the exclusive use of the ground”. In 1925 their request was turned down with that reason. For those who’d like to read more, there’s an article by John Guillmant about the Church Lads Brigade on page 57 of “Shirley from Domesday to D Day”. 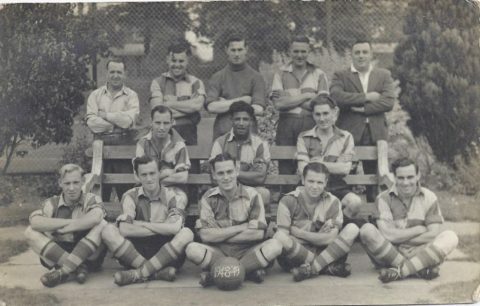 It doesn’t mention the football, but it does mention that the Church Lads Brigade became a boys club in 1935 – one of the city’s earliest youth centres – led by Colonel Ashby, who was awarded a CBE for his work on behalf of the youth of Southampton. This was also the origins of the Ashby Centre in Stratton Road, very near St.James’ Park. 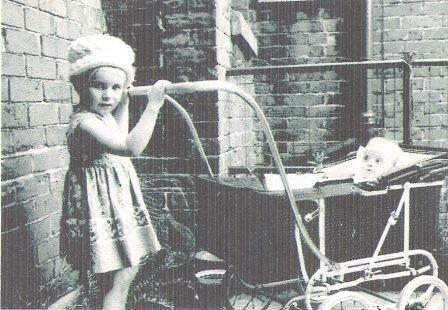 Mrs Rita Judd’s family lived in Church Street, Shirley, where the Shirley Telephone Exchange now stands. 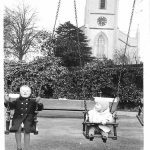 From her earliest memories she remembers that many of her weekday afternoons in her early childhood were spent in St.James’ Park – then known as Shirley Recreation Ground – which was always considered a safe and very pleasant park. As a teenager, although living elsewhere, Mrs Judd remembers playing tennis on the courts in the Park, where there was an attendant to whom you had to pay a fee to use the courts for a set time. 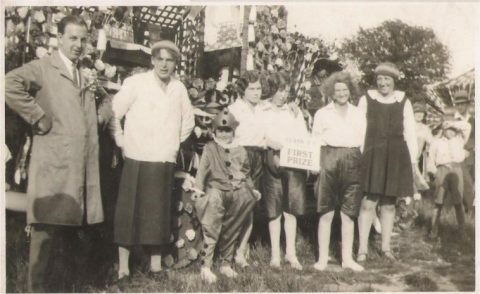 Left to right: Tom Hicks (Mrs Crates’s father), Fred Hicks (Mrs Crates’s uncle), Hazel aged about 6 years old in fancy dress, an unknown lady, Mrs Dorothy Hicks (Mrs Crates’s mother), an unknown lady, and Aunt Beatrice (Fred Hicks’s Wife). 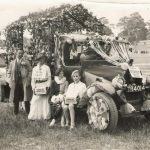 At the FoSJP First Birthday Party event in May 2007, Mrs Hazel Crates kindly brought along some interesting photographs from about 1930 of her grandfather’s dairy delivery truck, featured in the Shirley Carnival and pictured in the Park. “My father, Tom, continued to work as a driver at the dairy even when my grandfather sold the dairy to one of either the Brown or Harrison Dairies. I always forget which one he sold it to, as they later merged to form the Brown and Harrison Dairy. My father eventually left Brown and Harrison to open a grocer’s shop in Hamble. 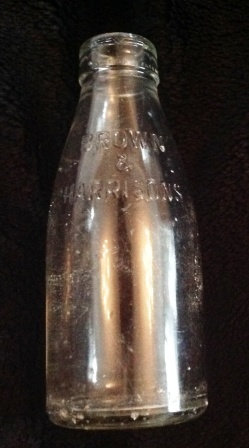 “We have recently had to re‑turf our garden, and upon digging over the soil my Dad came across this milk bottle…still intact with the name Brown and Harrison’s on it. My Mum said this was the milk bottles they used to have at school – she’s in her late 60s now. Editor’s Note – FoSJP has been lent an SCC Museum photograph of a similar WW‑II ARP Unit to those based in the Park. This was on display at the FoSJP History Exhibition in May 2009. 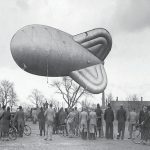 Many people have mentioned remembering the barrage balloon over the Park. We wonder how often it was there and indeed how many of them? If you have any memories of this please let us know. Editor’s Note – The Supermarine Works was extensively damaged by the Luftwaffe on 25th September 1940, after which the Air Ministry ordered that production be dispersed; in Southampton alone, production was later carried out over 28 locations employing about 3,000 people. See here for more information. Editor’s Note – Denehurst School was in the garages of the house just opposite Shirley Parish Hall. Editor’s Note (September 2012) – We were very sad to learn that Lynda passed away on 28th August 2012. We are very grateful that she contributed this part of her personal history so that it can be shared with others. Our best wishes and condolences go to her family and friends. Editor’s Note – The Reverend Marks was vicar from 1948 – 1959. Editor’s Note – On a 1971 map we found Ashbourne Flats on Wordsworth Road, on the section between Church Street and Stratton Road, located between the house called “Red Cedar” and the terraced houses that lead to the corner of Stratton Road. Perhaps these flats were named after Ashbourne House? See Judy at the same location in 1970, below. Editor’s Note – The site of the Children’s Hospital is now a housing development – June 2011. 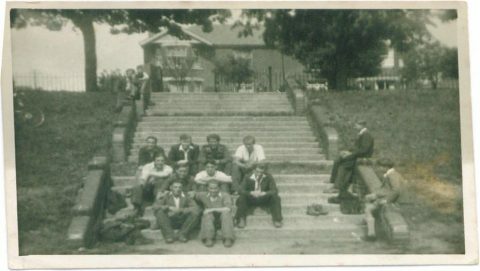 In March 2010, Lesley Stapley (née Shotter) sent us this photo of her father, Sidney Shotter (born 1928), and a group of his friends known as the “Shirley Boys”, sitting on the steps of the former Winchester Road entrance to the Park, between 1952 and 1958. Lesley’s father, believed to be the first on the left in the second row, has since passed away. 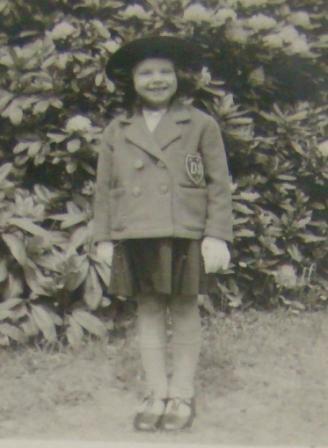 If you have any information for Lesley, please e-mail Michaela at history@fosjp.org.uk. Thank you! 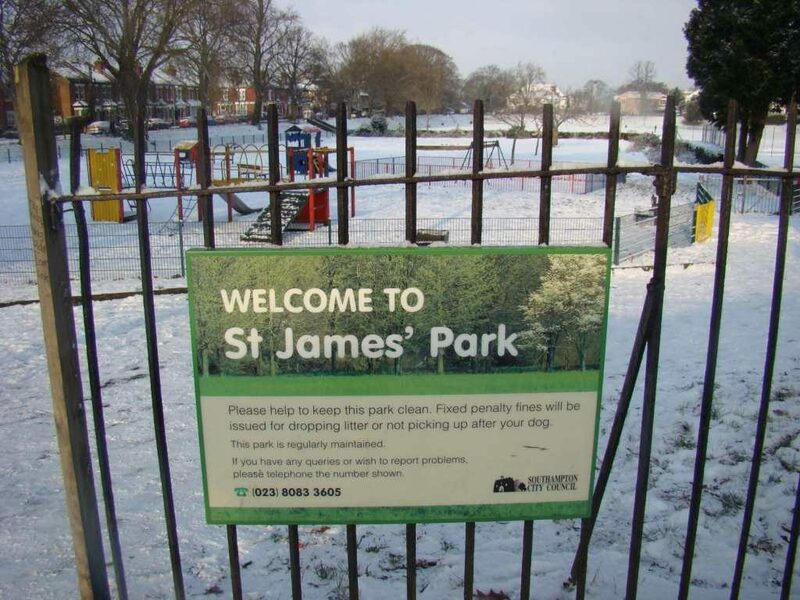 Editor’s Note – The Gents toilets were just outside the Park railings. Editor’s Note – Jean now lives in Beverley, East Yorkshire; she caught up with St.James’ Park via our website. 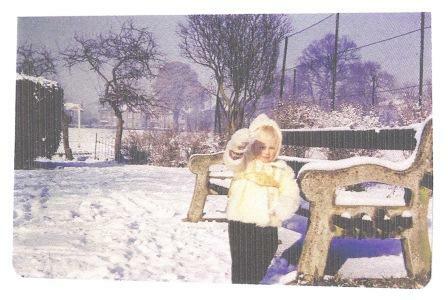 “It was in St.James’ Park that I learnt to walk again after the muscles in my legs had deteriorated due to the feet being flat whilst unconscious for so long. Bittersweet memories indeed. Every time I pass I think of those days and the wonderful people involved in my care. The beds in the hospital still bore the names of the sponsor in pre‑NHS days, one such being The Atherley Laundry. Editor’s Note – Our Heritage Coordinator was invited to a conference of the Oral History Society at the University of Sunderland to share how people’s memories have been integrated into the new designs in the park, and whilst there met Joan. 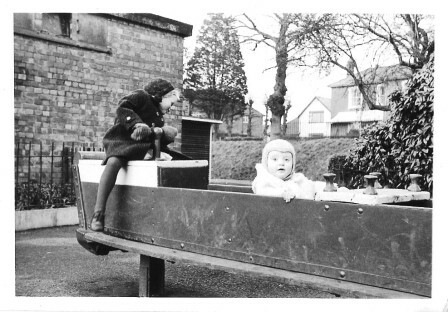 Joan followed up these two photographs with two more of her and her brother in the Park. 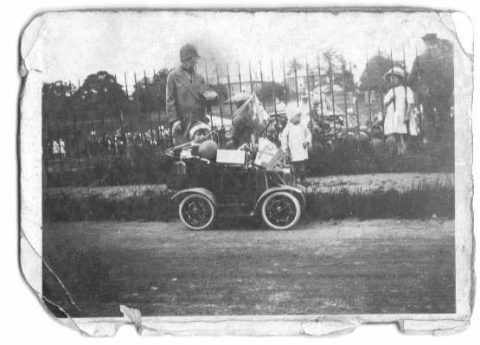 Editor’s Note – Teresa was waving from the balcony of the Children’s ward – a photograph of this is held by SCC Museum Services. Editor’s Note – The Children’s Hospital was indeed transferred to Southampton General Hospital’s G Level East Wing in 1974. See here for more information on the history of the Children’s Hospital. 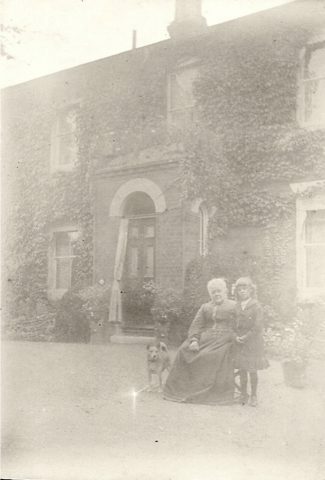 One of our other contributors has spotted her father in Mrs Judd’s photo above! 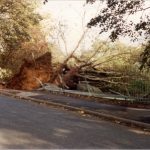 The trees on Winchester Road used to be within the Park, but when the road was widened from a two-lane to a three-lane highway (some time in the 1970s we believe), the boundary of the Park had to be moved back. Thanks to a campaign by local residents, the trees were saved from destruction, although they’re now outside the Park itself. It seems that there have also been other such campaigns – for example, one to save an evergreen oak tree. 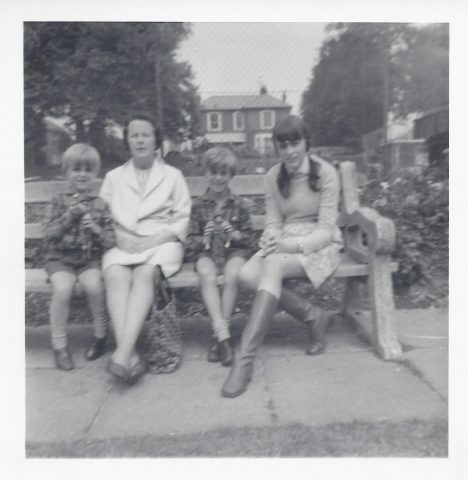 This photo was taken at the same location as that of Judy’s uncle’s and father’s football team above, on Sunday 27th June 1970. 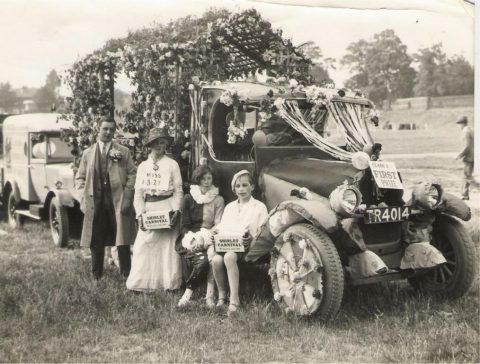 Mrs Johnson is pictured with her grandmother and her siblings after they won a prize for their miniature car in the Shirley Carnival, c.1930. You may have noticed that the railings around the Park have had their spear-like ends sawn off. We have a photo from the 1930s (kindly donated by Mrs I Johnson) that shows very pointed railings. 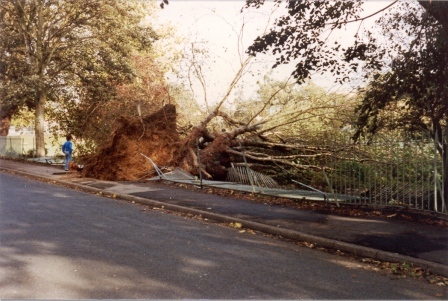 A lady once told us that a boy had been killed whilst climbing the railings at the Winchester Road end of the Park, and this was why they were sawn off. However, at FoSJP’s Tee in the Park! event in July 2008, we were told that the boy didn’t die, but survived – apparently he was a boy from Bellemoor School at the time of the accident. People were guessing that this happened around about 1986, but if you know any better, or if you happen to know the boy in question, we’d love to hear about it! 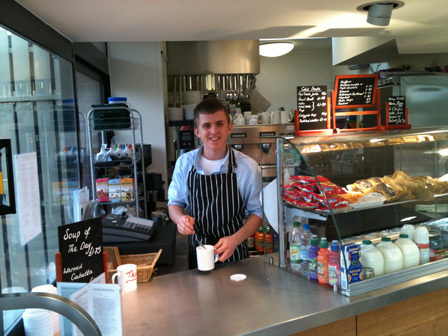 On Saturday 15th September 2012, Carl Harvey worked his last shift at the ParkLife Café before moving onto a new job at the Olive Tree Restaurant in Southampton. Carl’s story is a real success for the restoration & improvement project, and stands for everything we have been trying to achieve. Carl, 21, is father of Mia Louise, aged 19 months, and partner to Holly. Although originally from Shirley, the family were offered accommodation near Bursledon, which meant that Carl has been balancing the job, new parenthood, and lots of travel by public transport over the past two years. 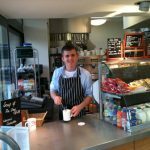 If you’re a customer of the Café and have a message of support which might help Carl with job hunting in the future, we’ll ensure that it gets passed on. Here are some of the stories down the years about St.James’ Park that you’ve shared with us, from the 1920s onwards. 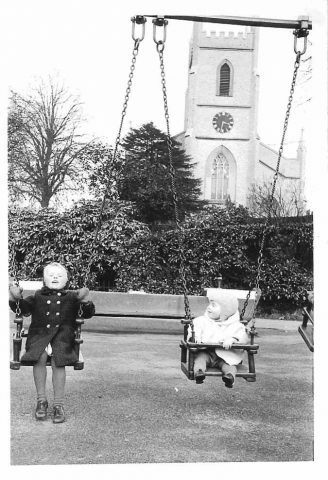 If you have any memories or pictures relating to the Park, and you’d like to share them with us, please contact us by letter, telephone, or email at history@fosjp.org.uk, for the attention of Michaela Lawler-Levene, our FoSJP History Coordinator. We’d love to hear from you!